External links are a necessary part of the web. The internet lives off them. They’re a necessity, so why is it that people shy away from linking out? Are they afraid their site will get hurt? That Google will penalize them, decimate their traffic? Do they cringe losing visitors to their competitors? That their business will fail and go to others? I think it’s a little bit of everything, and it’s really hurting honest webmasters in the SERPS. Luckily for you, this article is going to help you get over your linking out anxiety, but that’s not all! You’re also going to learn about 5 awesome hacks you can use today to extract SEO value from every link you send out. The entirety of the web is interconnected; one whole; one living, breathing entity. And your site is a tiny part of it. Yes it is, no use denying it. So be a part of it. Do it by linking out! Stop pretending like you’re the only one there is. Stop acting like you’re special, the only one in your niche. You’re not. So give. Link out liberally and you will get something in return- simple. Linking out- this is the foundation and all hacks and tips you’ll read below build on top of it. #2- So you now know you need to link out, great. But to whom exactly? You earn benefits from linking to both types of sites, but there’re differences too, so let’s cover them here. Note: did you know that Ahrefs found that linking to DR 70+ is helpful with Google rankings? Here’s what you’re telling Google when you send a link to a trusted website in your industry. My site is in the same niche as they are. So one link to an authority site gets you a very small but direct SEO boost, and an indirect gain from being associated with the best in your industry. This is passive benefit you automatically get when linking out. But there’s also an active benefit you can get from being proactive just a bit. In other words: you need to reach out and let them know about the mention. Now, you might think they’re such a huge website, that they must get dozens of emails like this every day, so they’re not going to pay attention. But that’d be a mistake because other folks have that dilemma too. and most will never outreach. You do it, and you’ll stand out and be remembered. This is a quick email, just to let you know that I recently published a blog post about (topic) and within that post, there is a link to your article about (topic). Your guide is superb and deserves a mention. When they receive your email they’re going to be intrigued and’ll want to check you out. And if your piece is good- they’ll share it. And they’ll certainly remember you, which is your main goal. The benefit here is that you can connect directly. Small sites are usually run by one passionate webmaster, and since they all love their blogs so much, they’re going to really appreciate it when you reach out to them and tell them you linked out to them. It’s out of the blue, unexpected, pleasant surprise. This is a quick email just to let you know that I recently wrote an article about (topic) and within the piece, there’s a link to your blog post about (X). Great stuff- it deserves that mention! Nofollow tag has its purpose and it was invented with a reason. But that purpose and that reason are not to use it when linking out. In my opinion, it’s better not to link at all than to link out with a nofollow tag. Most webmasters really care about their sites. And they work painstakingly hard to put together the best user experience they can. From design, to content, to everything else. And then you swoop in, use the information they’ve gathered on their blog, and you link to them- with a nofollow link. That’s a true slap in the face. You took advantage of their hard work and then you went out of your way not to help them with their rankings. Again- it is better not to link than to give out a nofollowed link. Because, the webmaster will probably not be grateful you mentioned them, but they also might grow to dislike you as someone who takes advantage of people. I’m talking about this from my own experience. I remember the time I built my first link. It was a link roundup, my first, and I was very excited and eager to give the best possible contribution I could. So I did my best and when the post went live I checked on my link and it was followed. Oh what a joy, I tell you, you never forget your first “real” link. I wanted to jump through the roof with excitement because I could already picture oodles of traffic coming my way. Then tomorrow, when it was time to get back to work, I wanted to check again on my link to make sure all was ok and to encourage myself to continue plugging away. I checked… and it was nofollowed. It turns out the webmaster went into the post and selectively (so not all of them) made some links nofollow. I guess he thought he could preserve PageRank like that (hint: Page Rank sculpting no longer works- PR dissipates through nofollow links). I felt really offended, I admit it. Note– For this tactic to work, you need to have guest-posted on other sites in your niche. Here’s what you need to do. Next time you write an article on your site, make sure you keep near you a list of sites you guest-posted on, so you can link to them when it makes sense. That’s nothing wrong from Google’s point of view because you’re simply linking to other useful and relevant content that lives on other websites, and that just happens to be authored by you. #1-Your guest posts will get more authority to their name which means more equity will flow back to your site through your links. #2– Your guest post will rank higher, which means more traffic and more people clicking and visiting your site. This builds up your brand. #3- You strengthen your relationship with the webmasters to whom you’re linking out; which is always a good thing. I know I said three, but there’s a fourth benefit, and it’s a true hack- brace yourself. #4– This Majestic study showed that PageRank flows through internal links on a website and that a page that has many internal links pointing to it is much stronger than the one with only a few, or none. This is nothing revolutionary, right? You guest on a website, not once but for example, four times. 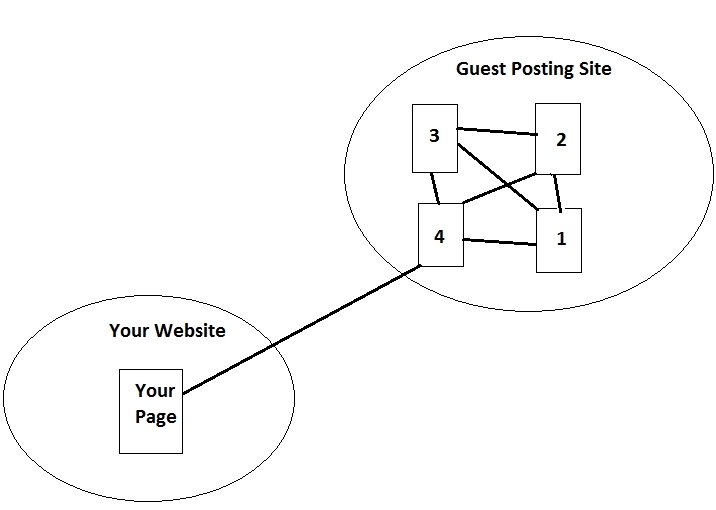 So you have the perfect opportunity to interlink your guest posts, and here’s how exactly. Then you build links to the fourth guest post you did. And that equity will flow through internal links to other three guest posts. But also remember that the second and third guest post also have valuable internal links, and finally, all four articles host direct links to your money site. #5- Link out to your competitors, Yes, really! When you do, you present yourself as a good citizen of the web, ultra cool and above all, confident that you possess so much value that you’re comfortable in sharing it with others. This impression of you will help you get established as an authority in your niche. #1– Don’t link to the exact page you’re competing against in the SERPS. That’s just nuts because your link will tell Google that their page is better than yours and that they should rank it higher. Which is exactly what you don’t want to achieve. #2– Don’t use keywords. If you and your competitor are both vying for “red shoes” keyphrase (the most overused example in internet marketing- I know); then don’t use the anchor “red shoes” or even “these are the best red shoes online”. Linking out to competitors helps you much more then it helps them. I speak from experience, and I know that most of my competitors are gigantic sites compared to mine (are you in the same situation?). So when I link to them it helps them a little. But when they notice me contributing and start returning the favor by linking back, then their links help me a lot. Is this something that looks appealing to you? Would you click on every link? Would you even read? Here’s another reason why you shouldn’t go overboard with linking out- loss of PageRank. Yes, PR is still alive and flowing through every link on a page, internal and external. So, have too many links and your page will become weak and all internal links on it will become sterile and unable to flow authority and help your site rank better. Because it’s good UX. People that click on them might be interested in that other post. but they probably don’t want to leave in the middle of reading yours. Also, keeping folks longer on your site has all kinds of positive SEO ripples. It increases dwell time and reduces bounce rate. And that person might later share the post, and leave a comment. They might even link to you! Bottom line– External links get their own browser tabs- Make it so! You want to prevent 404 errors from creeping into your site and ruining the impression you give off to the readers. Once you have it, go turn it on and let it do its thing. If you have a small website you’ll get your report in minutes. If your site is humongous with thousands of pages, then the scan will last a couple of hours. But that’s ok too; you only need to do this once in a while. Note: this plugin will discover all dead links. Meaning both internal and external. That’s great because internal 404’s leak link equity and steal away from your rankings. Conclusion: Do you now know why you should be linking out? Will you do it from now on? The web is interconnected, and it thrives on links. And you can either be a part of the thriving community, holding and owning your rightfully earned place; or you can shut yourself in your ivory tower never to be heard of, never to be seen. 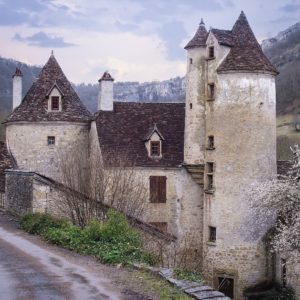 Montvalent / Pixabay. Are you still inside? You need to get out, now. But hey, it’s not all so black in there. At least you won’t’ be linking out! Thank you for reading, if you have questions leave them in the comment section below and I’ll respond to each and every one.